In a time in which postapocalyptic fiction constantly trying to outdo itself in disaster, Lily Brooks-Dalton has produced what might be the quietest, gentlest most heartfelt view of the end of the world to date. 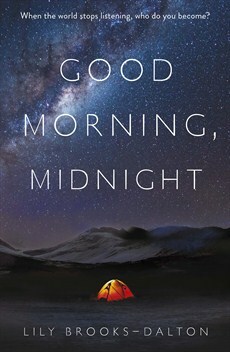 The apocalypse in Good Morning, Midnight happens offstage, the view of it is from an extreme distance from which nothing is known other than there is no longer any telecommunications and, later, that all of the world’s lights are off. All that the reader knows of the event is that it has left some people stranded – in particular Augustine, an aging astronomer at a remote Arctic observatory, and Sully, a communications specialist, part of a team of explorers returning home from an exploratory trip to Jupiter. Good Morning, Midnight revolves around the lives of these two characters and those around them. They are different tales of survival and loss, Augustine chooses to remain at a remote arctic outpost when it is hurriedly evacuated and has an eight-year-old girl, accidentally left behind, for company. Food and warmth are not an issue but eventually the need to communicate with the outside world is and Gus decides that has to find a way to navigate them across the tundra to a radio facility some distance away. Sully is part of a team of six explorers, trained to deal with most eventualities except the one that has confronted them – a total and unexplained loss of communication from Earth. As with Gus, their physical needs are well catered for but there are still technical challenges associated with their desperate need to communicate that they have to overcome. The physical travails are really only the foreground for this tale. Brooks-Dalton is more interested in the internal lives of these characters and the way in which they are forced to re-examine their lives in the face of the seeming disaster. Both Gus and Sully have deliberately and in different ways cut themselves off from human connection in their pursuit of their goals. And by coming to terms with their situations and observing the other with them, both are forced to consider what this has meant to their lives. The two stories are very separate. They twine around each other, touching only tangentially and then more deeply. But aside from these obvious connections there are deep thematic and emotional resonances between them. There are no zombies, no killer virus, no environmental catstrophe but rather the simple question of how would you evaluate your life and how would you go on if you were indeed one of the last people on Earth. Good Morning, Midnight is, strictly, science fiction (there is a spacecraft that has been to Jupiter after all) but it does what all good science fiction does – using its scenario to explore what it means to be human. It has been compared variously to Station Eleven (presumably for its postapocalyptic styling) and The Martian (again, presumably, for its person alone against the elements and spaceship repair plot lines). But their real similarity is not in particular plot devices or settings but in their exploration of humanism in the face of extreme change or challenge. And in Good Morning, Midnight, Lily Brooks-Dalton has managed to craft an original, effective, and fascinating debut that is more than able to stand on its own.